We made homemade ice cream last night after dinner and it was a hit! This recipe is perfect for when you just want to make a small portion of ice cream or “wow” your kids! Only takes three ingredients and no need for an ice cream maker. 1. 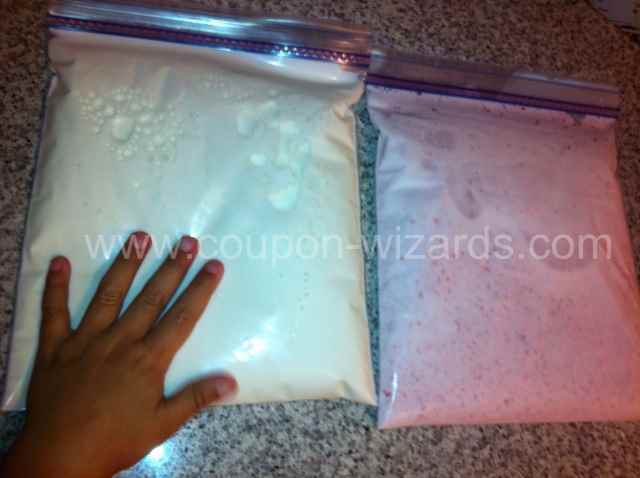 Mix Sugar, Half & Half and Vanilla Extract and pour into a quart-size Ziploc bag. (We also made a batch of strawberry ice cream using the same ingredients and adding an additional tbsp. of sugar and 3/4 cup fresh strawberries and blending). 2. 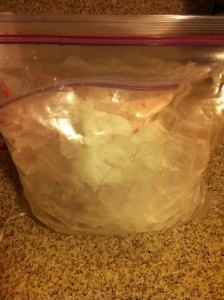 Place Ice and 1/2 cup of coarse salt in gallon-size Ziploc bag, place bag of ingredients on top of ice. Pour more ice and remainder 1/2 cup of salt and seal bag. The kids and I danced around the kitchen singing and dancing while shaking the bag. WOWOWOWOWOW! You are simply the best when it comes to ideas, projects, crafts, food… you are a ROCKSTAR in my book! We’re definitely going to do this soon! I’ve got an icecream birthday cake in the freezer to finish first! I may never get back to my diet … lol Thank you soooo much for this! Thank you Carolyn. I’m glad you’re enjoying them. It has to be a coarse salt to create the friction, I believe. The kind of salt you’d wake in any traditional home made ice cream making. I tried this but I didn’t have the coarse salt, but it seemed to work okay. I’ll try it next time with the different salt! This looks soo cool & easy to make. I’m sure the kid’s will have fun making it. Thank You ! Each bag serves about 2-3 kids. Uhm, what would half and half be for any of us who don’t live in the USA? Half and half is a dairy product consisting of equal parts light cream and milk. With a fat content of between 10.5 percent and 12 percent, half and half falls between light cream, which contains anywhere from 16 percent to 29 percent butterfat, and whole milk, which has about 3.5 percent butterfat. Half and half is the equivalent of what’s known as “half cream” in the U.K. I have the same question as Kamrin. How many kids would one bag serve? I’m thinking of making this in summer camp with 2 year olds. I have done it using regular milk and table salt. The salt is used to lower the temperature of the ice. We did it in a class of about 20 kids. We used snack and sandwich bags. They loved it. I am going to try this with my home economics class the last week of school. I’d love to follow you for more creations like this. Are you on Pinterest? I am Greenay on there. Thanks for sharing. I’ve been making this for years and I love it! I couldn’t get mine to work either. Even added more ice cream salt to the bag. im thinking about doing this and i was wondering do you have to do it in a ziploc bag? 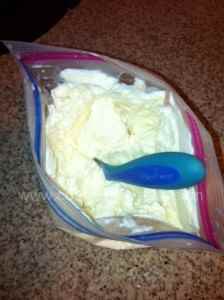 I used a ziplock for the milk product and I threw it in a ice cream bucket of ice and salt. We used two different sized coffee cans in school.